This legend from Japan has made appearances in just about every racing game made from Need for Speed to Gran Turismo. It has made appearances in no less than 6 of The Fast and Furious movies. And yet, “Godzilla” never officially made it to the US shores. Of course, we are talking about the Nissan Skyline GTR. But while everyone knows about the incredible R32 Nissan Skyline GTR, the car that earned the model its Godzilla nickname, the history of this highly coveted tuner car goes all the way back to 1957 in a ward of Tokyo called Suginami, Japan. After the end of World War II, a company called Tachikawa Aircraft dissolved and was renamed Fuji Precision Industries. After several name changes, the Suginami based manufacturer settled on Prince Motor Company, named to honor the Prince and now Emperor of Japan, Prince Akihito. 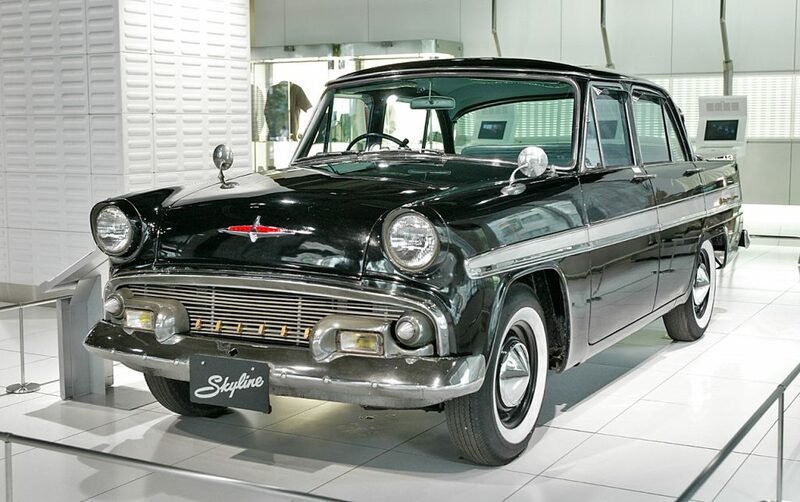 Introduced in 1957, the Prince Skyline was not the all-out performer it is today but rather a luxury sedan. Prince did, however, introduce a more stylish Skyline Sport that was available in coupe or convertible format. With much more modest production numbers, the Sport did find its way into a number of Toho/Fuji Media (think Godzilla) movies of the early sixties. Moving ahead to 1964, Prince decided it was time to put a Skyline on the racetrack. Beginning with an earlier model, they did some major performance modifications including the addition of a straight six motor from a Gloria that made up to 125 horsepower in its top configuration. The car debuted at the second Japan GP in 1964 and took second through sixth place! 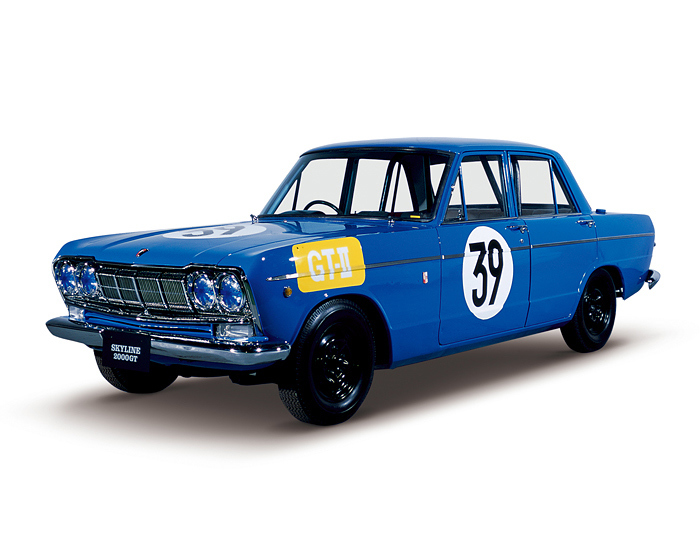 Highly successful in GT racing, the newly named Skyline 2000 GT (S54) was then put into full production in the Japanese market. Around the same time, the Japanese government decided that larger automotive companies should be created to ensure their success and longevity in overseas markets. Since Toyota had already merged with Daihatsu, the next logical partner was Nissan. 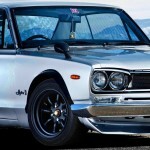 Prince joined with them in 1966, and the Nissan Skyline was born. 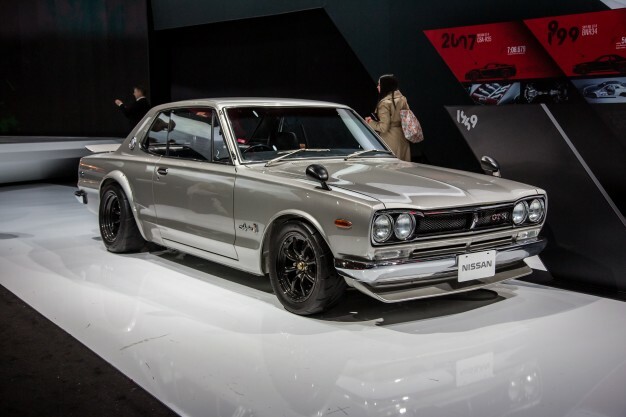 Making its debut at the 1969 Tokyo Auto Show was the first high performance version of the Skyline, the GT-R. Power comes courtesy of a DOHC 2.0 liter inline 6 making 160 hp, a very advanced and powerful motor for the time. While originally released as a four door sedan, Nissan introduced the more familiar two-door coupe in 1971. Much like the factory race cars coming out of Detroit, the Skyline was stripped of all unnecessary weight in order to improve track performance. This car started the near universal adoption of the “-R” designation for the factory performance or racing version of a model. As a nod to how influential Skylines are to the Fast & Furious franchise, you can catch a glimpse of a ‘71 in 2011’s Fast Five. After little success with the 2nd generation GT-R in the ‘70s as a result of the worldwide oil crisis, Nissan came back strong in the eighties with the introduction of the r31,32, and 33 GT-Rs. Production on these models began in 1985 and the GT-R maintained this general body design through 2002. The R31 saw the reintroduction of the DOHC inline 6 engine, producing 210 hp. Introduced in 1989, the R32 featured a NISMO twin-turbo 6 cylinder with AWD, capable of 280 hp. The GT-R R34, produced from 1999 to 2002, was the culmination of over a decade of competition resulting in the most technologically advanced Skyline… and priciest with a sticker of just under $90,000. A ceramic twin-turbo inline 6 put out 276 hp with full-time AWD. New features included an LCD multifunction display that put important engine data right smack in front of the driver as well as 6 speed Getrag transmission. While the Nissan Skyline has been a fixture in Japanese movies and television since its inception, in America it’s the Gran Turismo video games and The Fast & Furious movies that introduced the R32 version to US car enthusiasts. 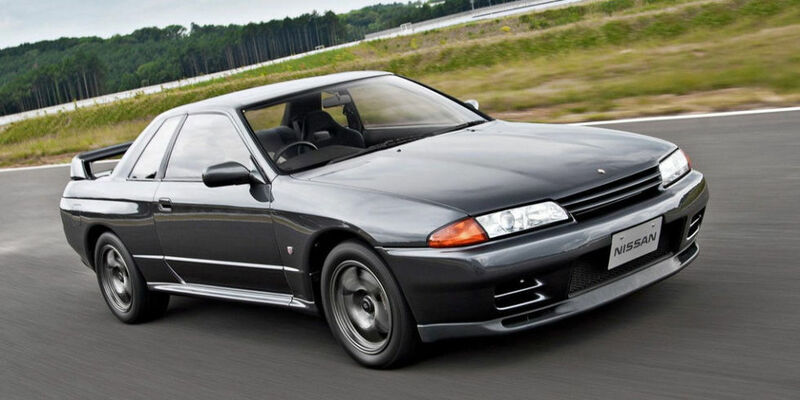 This has caused huge demand (and huge price increases) for the 1989-1994 Nissan Skyline GT-R which have just recently been legal for import due to the 25 Year Rule. And for the deep pocketed GT-R fan, you can actually own arguably the most famous GT-R of them all, Paul Walker’s R34 Nissan Skyline GTR from 2009’s Fast and Furious. This car was owned by Paul Walker and sports only 3,728 miles, plus a whole ton of modifications to both the look and performance of the car. The price is a secret but said to be between $1 and 5 million dollars. 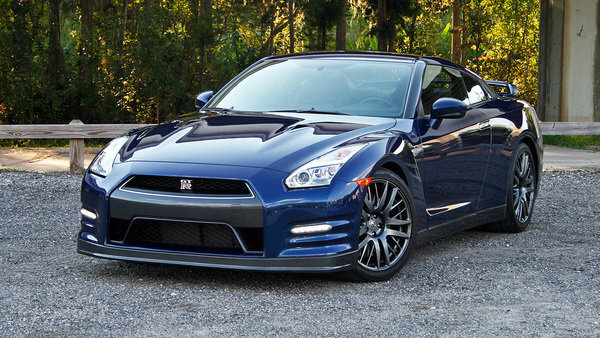 Finally, in July of 2008 you could go to your local Nissan dealer and get a GTR. However, there’s a catch. At this point, the GT-R was no longer carrying the Skyline moniker. Not to mention, the trademark & highly successful straight six engine layout was also shelved. In its place was an alloy V-6. In the spirit of the RB26DETT, a motor used in nearly 20 years of Skylines, the twin turbos were kept making the new GTR capable of 473 hp and 434 ft lbs of torque. Top speed is now an extremely impressive 195 mph with 0 to 60 times in the low 3 second range. 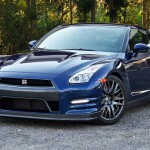 Styling is modern and very aggressive but with considerable homage paid to previous GT-R models. Does that mean it’s part of the Skyline Family? Some say yes, but many enthusiasts feel that the “real” Nissan Skyline GTR ended with the end of production of the R34. Are you in the market to buy and get imported a Nissan Skyline GTR R32? Then you are in the right place! After two and half decades of time has passed, a time for you to drive your dream GTR R32 has come! This is because of the fact that from the end of 2014, legendary GTR R32s manufactured in Japan started exceeding 25 years of age limit that and therefore eligible to be imported to the USA as regulation free. Specifically speaking, according to NHTSA regulations, 25 years old cars can be lawfully imported into the USA without any complies with the regulations of FMVSS. Also, EPA regulations state that if a vehicle is 21 years old, there are no EPA compliance requirements required upon importation. 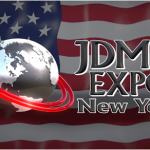 This means that currently JDM EXPO can easily deliver your dream vehicle such as Nissan Skyline, GTR R32, Nissan Silvia S13, Honda NSX, and Toyota Soarer and many others to anywhere in the Unites States since those vehicles are considered as 100% exempt from EPA and FMVSS regulations. 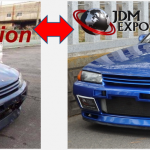 We, JDM Expo Co., Ltd. is the top exporter of JDM sports and classic cars in Japan and have the largest stock of Nissan Skyline GTR R32s in the world. Moreover, presently, not only do we ship our vehicles to the United States, but also get your GTR R32 registered and titled in the USA while delivering your vehicles to your front door at any state of USA.